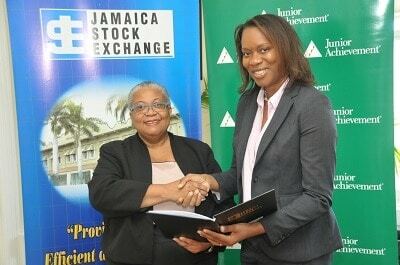 (KINGSTON, October 5, 2018): In a landmark agreement, the JSE and the Junior Achievement Jamaica (JAJ) signed a Memorandum of Understanding at the Offices of the JSE, 40 Harbour Street. The purpose of this MOU is to establish the terms and conditions under which (JAJ) and the JSE will work together in establishing a mutually agreeable framework for collaboration. This framework will focus on the inclusion of the JSE Stock Market Game Competition, as a competition within the Junior Achievement Company of Entrepreneurs (JACE) Programme to be known as “JSE Junior Achievement Stock Market Competition”. This collaboration will benefit to both organization as they seek to educate high school students about the financial matters. The JSE is focused on the Junior Market and JAJ is focused on financial literacy empowerment. Mrs. Marlene Street Forrest, Managing Director of the JSE, commenting on the MOU, stated, “This is a great moment for the Stock Exchange as we are focusing on financial literacy for our young people and where better to begin than in the schools among the 4th to 6th form students. We are extremely happy to partner with the JAJ to achieve our goal and to allow for greater penetration of the market. Once our young people learn about investing from an early stage the likelihood of wealth creation is greater and this auger well for the country. This agreement is timely as Bloomberg has recognized us as the number one performing Exchange in the world and to continue the momentum we must engage our young people”. According to Miss Alphie Mullings-Aiken, President of Junior Achievement Jamaica “Junior Achievement (JA) is the world’s largest organization, dedicated to educating students about workforce readiness, entrepreneurship and financial literacy through experiential, hands-on programmes. JAJ programmes help prepare young people for the real world by showing them how to generate wealth and effectively manage it, how to create jobs which make their communities more robust, and how to apply entrepreneurial thinking to the workplace. Students put these lessons into action and learn the value of contributing to their communities and where else to start this process of financial literacy than at the JSE. This programme is set to benefit over 15,000 students annually, across high schools in Jamaica.